Dennis Dierking goes through a cool-down stretch with the rest of the class following their workout at the PWR!Gym, 134 W. Fort Lowell Road, on March 18. 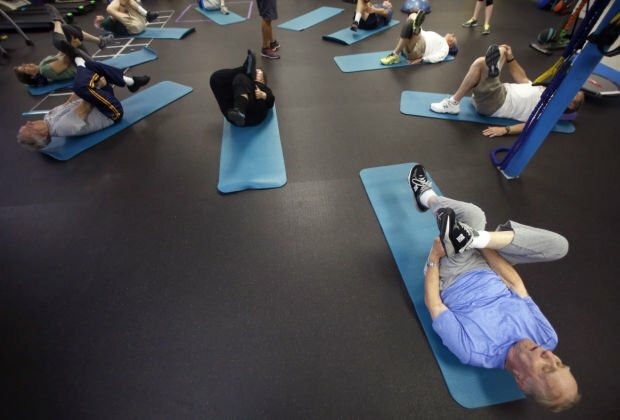 The gym offers physical therapy along with exercise classes for people with Parkinson’s disease. Hans Lipp balances on a half-ball at one of the stations at the PWR!Gym, 134 W. Fort Lowell Road. An April 13 hike at Catalina State Park will help raise money for the gym. Phil Airulla weaves his way between foam makers carrying a kettle bell as he works out a session at the PWR!Gym 134 W. Ft. Lowell, Tuesday, March 18, 2014, Tucson Ariz.
A little more than two years have passed since a small gym, sandwiched between a church and discount grocery store on West Fort Lowell Road, opened for people with Parkinson’s disease. What began with only 40 members has since expanded to 100. And the need is growing. Close to 250 people a year are newly diagnosed with Parkinson’s in Tucson alone. In the U.S. there are 50,000 to 60,000 new cases of Parkinson’s diagnosed annually, according to the National Parkinson Foundation. Farley said she hopes to expand the gym, at 134 W. Fort Lowell Road, with more programs and staff by Sept. 1 and double the space to develop outreach and train other instructors in Southern Arizona. Before Farley opened the gym, she developed a therapy program for those with Parkinson’s disease. However, she soon realized therapy wasn’t enough and she needed to develop a comprehensive approach. The exercises focus on big and fast movements and on improving function. Challenges for those with Parkinson’s include getting out of a chair and standing up from the floor, and the purpose of the gym is to help members practice these skills as well as other coordinated movements. The gym also provides physical therapy and consultations for people with Parkinson’s. It’s $75 a month for a gym membership. Farley said the gym has people from all over the U.S. and Canada coming to get help — and dozens of people from here and elsewhere have gone there to have a physical therapist develop a home exercise regimen for them. Farley eventually hopes PWR gyms will open all over the country. 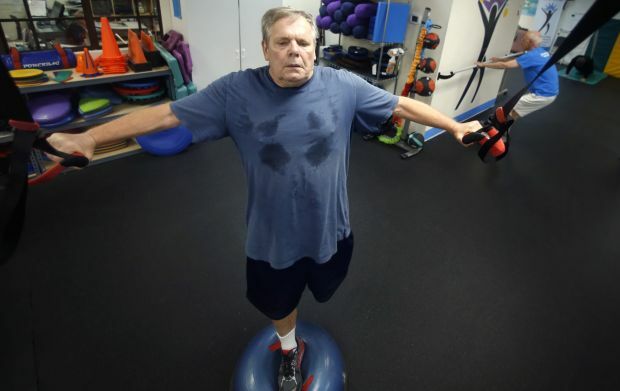 Tim Bowden, a professor emeritus of cellular and molecular medicine at the University of Arizona, was diagnosed with Parkinson’s disease seven years ago and began physical therapy with Farley shortly after. He credits the gym for his ability to continue the activities he loves. For the past four years, Bowden and his wife Diane have been working to raise funds for the gym through their Bowden PWR Hike. The money from the hike helps fund the group classes and is the only official source of fundraising, Farley said. This year’s April hike is different in that there are three distances offered for participants: a 1-mile, 4-mile and 10-mile hike at Catalina State Park. Also this year more of the participants have Parkinson’s. Nathaniel McMullen, professor emeritus of cellular and molecular medicine at the UA, was diagnosed with Parkinson’s in 2011 and joined the gym shortly thereafter. McMullen is participating in the 4-mile PWR Hike and said he hopes it will result in increased funding for the gym. McMullen said the gym has helped provide him power over Parkinson’s. The Fourth Annual Bowden PWR Hike is planned for April 13. Go to www.pwr4life.org/bowdenhike to register for the hike or make a donation. For more information about the PWR!Gym call 591-5346 or go to www.pwr4life.org online. Exercise can have a long-term impact, improving gait and reducing risk of falls.